A man paralysed from the neck down has urged health bosses to reconsider after his 24-hour care package was removed. Ron Fraser, from Dingwall, has been diagnosed with clinical depression since his help was cut to four-and-a-half hours a day in July. His GP says this is "directly attributable" to changes to his care. Mr Fraser suffers from MS and his condition is progressive. 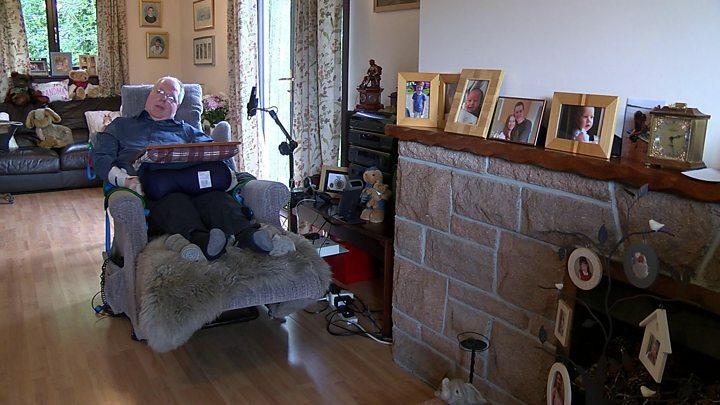 He cannot move his arms, legs or torso and has received round-the-clock care in his home for nine years. But in May this year, that was revoked by NHS Highland, cut to seven-and-a-half hours per day, and further reduced to four-and-a-half two months later. So far, efforts to reinstate his 24-hour care have failed. He told BBC Scotland: "I was given ten days' notice that the night care package would be removed, with assurances that a suitable cover would be put in place to meet my needs. This has proved to be totally untrue and there is no help. "I require help for basic needs - food, drink, dealing with spasms. During the day the carers move my position on a regular basis because I suffer from pain and spasms. And during the night it's the same. "But there is no night-time cover at the moment which is extremely difficult for myself and my wife. It's horrendous. There is no way I can stay at home on four-and-a-half hours. All they are doing is forcing me into a home." He added: "I'm only 61, my wife's 57. I am frightened and vulnerable. It's affected both my physical and mental health and the same can be said for my wife. We are frightened of the future." Mr Fraser, who held a senior position with the Bank of Scotland prior to his illness, has now been diagnosed with depression which his GP says must be directly attributed to the actions of the social work department. Mr Fraser added: "Social work have received countless letters showing that I have 24-hour needs. It is undisputed by doctors and also my hospital consultant. "NHS Highland have reduced me to a financial transaction that must fit within their budget. "I am a real person, and what am I to do when there is no-one to give me pain relief at night? I am expected to wait in pain, degradation and misery until my allotted hours of care arrive. "My doctor has informed social work that my illness is progressive and an early death will be the end result. I have had to watch my body disintegrate the last number of years bit-by-bit and with the help of a strong family unit and a touch of humour I think I've managed to deal with it as best I can. "I'm not looking for pity, I want to stay at home and enjoy what time we have left together." Local MSP Kate Forbes has described the case as "shambolic" and called for an urgent investigation into Mr Fraser's situation. She believes the integrated health and social care service of NHS Highland has failed to understand the needs of the patient. The Dingwall MSP said: "There is a man at the centre of this case who isn't getting the support he needs. It's heartbreaking that he should feel so frightened about the future. "And ultimately we want to keep people at home and make sure they get as much support as possible. "In Ron's case, there are a number of things which have gone wrong. There's been a lack of communication and joined-up thinking. He is not being listened to and we haven't seen a compromise in NHS Highland's position. "I would like to see 24-hour care restored for Ron Fraser because he deserves to stay in his own home." Mr Fraser's GP has sent letters to NHS Highland in an attempt to have his 24-hour care restored. Dr Jonathan Fletcher wrote: "I was disappointed when visiting Ron this week to find that he has succumbed to a significant depressive illness displaying marked symptoms and signs of depression having suffered from prolonged stress. "I was saddened to see evidence of his mental state manifest in poor concentration, agitation and really quite consuming ruminations and worries about his care package associated to nihilistic thoughts and hopelessness." NHS Highland told BBC Scotland it cannot comment on individual cases. A spokesman said: "This is an extremely complex case with a number of changing circumstances and considerations. "What we would say it at that we are extremely sympathetic to this family as we are to others in similar circumstances. Social workers have to make difficult decisions in challenging circumstances but will always make them with compassion. "We are in ongoing dialogue with Mr Fraser and his family to discuss future care." The Scottish government said everyone in Scotland had the right to "safe, compassionate care" that met their needs and respected their rights and preferences for support and how it was delivered, including the preferences of their carers and family. A spokesperson said: "We understand that NHS Highland are working with Mr Fraser and his family to ensure he gets the right support and the cabinet secretary for health will be asking NHS Highland to provide us with an update on this case." "While the statutory responsibility for delivering or commissioning care services, such as assessments, lies with local authorities, and integration authorities, including NHS Highland, we are taking action to protect social care and integration services - investing over half a billion pounds of frontline NHS spending in the current financial year."